This notion of enduring/staying in a place brought to mind a dimly-remembered Heidegger essay on building and dwelling and then Le Corbusier's famous "a house is a machine for living in". Could architecture and medicine be happily combined in a short story? Could we start to graft the two together, turning the body into a machine for building with? Here's a first and tentative draft for a sub-Calvino story, on Masochuticon: Fracture. The first line is a quote, and the story's critical structural weakness is that there is no story there yet! Like the patient, I must now endure - and wait to see if this story gets better. What, then, does Bauen, building, mean? The Old English and High German word for building, buan, means to dwell. This signifies: to remain, to stay in a place. The real meaning of the verb bauen, namely, to dwell, has been lost to us. But a covert trace of it has been preserved in the German word Nachbar, neighbor. "I am using Excel as a drawing tool. [...] These drawings were made by changing cell preferences for background color, fill pattern, and border styles and from time to time inserting 'comment' boxes and letters or words." "Instantly, it is obvious that the vessels are modelled on the piston shapes of Duchamp's bachelors." I remember watching a film on the black and white tv at Paul B's house. This would have been in the late 1970s. It had a science-fiction/disaster element, and seemed old even then - like a 40s or 50s film, though that could have been the small black and white box we watched it on. There was a stone-like substance which presumably came from outer space; it reacted on contact with water, growing suddenly like a crystal into vertical columns, and immensely quickly. It would get to a hundred metres in height and then topple or shatter, and all of the shards that fell to the ground would themselves start growing if they were in contact with water. And so it would continue, indifferent to the plight of humanity. Mayhem ensues, women scream, children flee, men grit teeth bravely, etc. The scene I remember clearly is when the clever scientists in the lab have discovered that water is an accelerant for this unstable stone-crystal they relax briefly at having at last explained the phenomenon, and ahead of the nearly insurmountable task of preventing it. 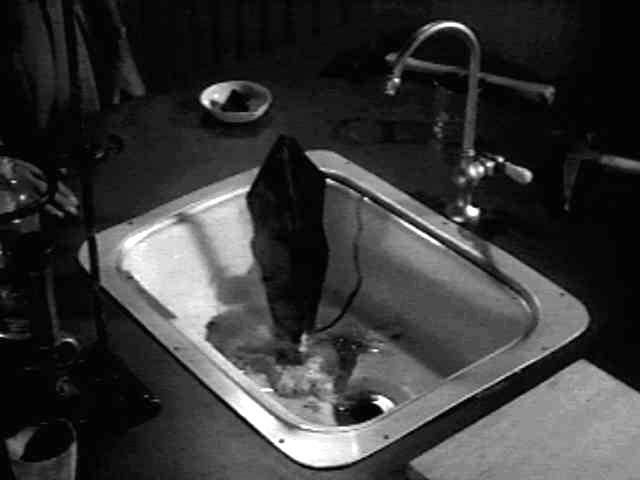 And in that moment of relaxation, one of the scientists brushes a tiny chip of the stone, a flake, into the sink (which the camera notices but the scientist doesn't), and then turns on the tap. Down the plug it goes, and a second later the sink is burst open by a crystal column, then the whole worktop splits apart and a couple seconds later the roof is ripped off the building itself. I forget how the film resolved, but watching it I do remember feeling that the situation was hopeless. Despite the fact that the title of the film would indicate so, the film's antagonist is simply rapidly growing crystals from space: albeit crystals that petrify humans on contact. These crystals grow to gigantic size upon contact with water, and absorb silica from whatever they come in contact with. Being that silica is the substance in the human body that gives our skin flexibility, humans become "petrified" if they touch the crystals. Once the crystals grow high enough, they topple over and crush everything in their path. Fragments of the crystals then go on to grow into giant crystals as well. Nice Flintstonesy titles too. Did Robert Smithson watch Monster Monoliths? "Language is the house of Being. In its home man dwells. Those who think and those who create with words are the guardians of this home." Also: Building Dwelling Thinking. "A pattern book of formal effects that you could point at and say, I'll have a bit of this, a touch of that and smattering of the other. So here it is, the I.M. (Meat) Pie Pei. It's got the lot." My copy of the Los Angeles Yellow Pages I stole from the Beverly Hilton Hotel three years ago; it has been a fund of extraordinary material, as surrealist in its way as Dali's autobiography. That's in User's Guide to the Millennium. And of course, his 1977 story 'The Index' proposed the index itself as the work of fiction (in Re/Search 8/9, War Fever or the Collected Stories). Umberto Eco chose the New York City phone directory on Desert Island Discs, explaining that he could use the list of names to generate all possible stories. Or you could take Finnegans Wake. Or shopping lists. And whilst some thriller writers appear to copy out the technical spec sheets of the armaments they fetishise, has anyone gone further in using Jane's Fighting Ships 1990-91 or Trafalgar's order of battle for literature? Lists and indexes (indices?) are attractive because you can easily use them to create new, magpie slices through the data of a book or the phone company's records, with all the risks of laziness and discontinuity that this brings. Phone books and Yellow Pages are very much outside (invisible to?) the bodies that they index, perhaps making it easier to turn them to new uses. Related: Borges saw Paris as "a city which you can consult like an encyclopaedia". And indexes and indexers in fiction. Customer: "RIM has made some movement on the carrier side, but on the device end, I still think Good is a much better fit." RIM will be hoping that MDS Studio fills this gap. What is different about the BlackBerry 8707v? The video is on YouTube: Prostitution is not illegal, slavery is. And Alex's site has a statement from the film-maker. Salon.com Books | "Black Swan Green"
Amstrad mission statement: "We just want your money"
Simple, and a neat distillation of the Alan Sugar method as seen in The Apprentice. On the irregularity in English pronunciation. A walk of coincidences, derived from overlaying a map of Paris onto London. What’s where the Eiffel Tower should be? Where can we stop for un Ricard? Towards the end of 2003 a ferris wheel from Paris was re-erected in the centre of Birmingham - but the French audio commentary had not been removed, and for several weeks the public viewed the English cityscape whilst being told to look out for Parisian landmarks. Outside the ICA, we talk of Paris as an invisible city overlaid on London - lovely. Can we imagine Joyce starting Finnegans Wake in a Victoria Palace Hotel sited on Bloomsbury Street rather than on rue Blaise Desgoffe, 6th? We also talk of wormholes to other places, thoughts, times and experiences. Are these wormholes to blank places? Is this wormhole disconnected? The team consults the maps at Trafalgar Square, the ground-zero of roads, miles and city-stories. We overlay a map of Paris over one of London and fix the I.M.Pei Pyramide to Nelson's Column (currently hidden under a scaffold for conservation). After some discussion and inspiration from Fiona, we rotate the map so that La Musée D'Orsay hovers over the Royal Academy, and decide to walk to it, a journey that will require a crossing of the Seine. We split into two teams - each will cross the Seine via different bridge, requiring a different route in London. Our team heads off, passing the National Gallery, which is showing Americans in Paris. We head from the Louvre towards the Jardin des Tuileries, turning right onto Whitcomb Street, where we see the ghostly outline of the Place du Carrousel. Its curve was sketched in chalk on the tarmac. We jink left and right through back streets and we cross the Haymarket and the lower part of Regent Street, both of which now feel like rivers of cars rather than roads because we're aware that we're approaching the Seine. On Jermyn Street to the west of Regents Street, the Tesco Express's EXIT sign seems to indicate the limits of terra firma. David and Sally look from the Pont Royal down into the river Seine. Far off to the left is the London Eye, currently installed on the Ile de la Cité. We know we're crossing the river because we pass a sprinkler sign. After the crossing, we reach the left bank on Duke of York street. As we look from the map to the pavement, the rive gauche chalks itself in. Further up Jermyn Street, we pass Isaac Newton's house and turn right into Prince's Arcade. I think this is where Manet's shocking Olympia (1863) is in the Musée. Someone mentions Benjamin's Arcades Project, and we all grimace because we haven't read it. The top of Prince's Arcade opens onto Piccadilly and the Rue Anatole (Air) France. I try to see multiple cities, like progressively thinner blankets overlaid on London, or acetates over a printed map. I see Calvino obviously. Or Joyce in Paris-in-Zurich-in-Trieste-in-Dublin-on-London. Does this multilayering work on other cities, in Los Angeles, Mumbai, Auckland? Is London an ur-city - a historied, storied spoilheap in which all cities might be found, a loom for weaving place-stories? Can we look further back, to ancient cities like Catalhoyuk? And shortly the teams meet again at back of the Musée D'Orsay: the Royal Academy. Stephen Hodge shares chocolates he has brought from Maxine's, and sets us two final tasks: firstly to text someone in French (Anneg, what's your number? ), and secondly to take a photo each from a set he took in Paris, and to leave them somewhere publicly. My photo is of the details for a house to rent near the Place de Vosges. It has "LOUE" handwritten across it - which I think means "RENT" or "RENTED" - or maybe it's "LOVE". I decide to scribble Duchamp's "Eau et Gaz" line on the back of it and leave it tucked inside a Duchamp book on the shelves of a bookshop - so that it might be discovered at some point in the future. But Waterstones at Charing Cross doesn't have any Duchamp books (and I forgot to do it at the ICA bookshop), so for the moment it's still inside the notebook, waiting for a Shakespeare and Co bookshop, whose Rue de l'Odéon must be somewhere down past the Houses of Parliament. A very interesting walk, thanks to Stephen, and David, Sally and rest of the team. All the pictures are here. And today it has been raining so the chalk marks have probably melted back into London's storyspoilheap already.